There is much to do in and around Montesoffio, close by and in the region, for families, groups and singles! For nature lovers there is a variety of lovely walks to choose from: through fields bursting with sunflowers, the woods in the nearby area, or the nature parks. In addition the area offers many caves that are well worth a visit, like the fascinating sinter-caves of Frasassi. Sports enthusiasts can choose from golf, cycling through the hilly landscape, or a few hours of paragliding and seeing this beautiful area from an entirely different view. Along the entire Adriatic coast there are many beautiful sandy beaches. The beaches between Pesaro and Marotta are particularly ideal for children, as the water there is safe and shallow. In addition to all towns and villages with lots of fun events, good restaurants and terraces in the region, you can also start walking or cycling directly from Montesoffio in the nearby area. For those who can't bring their own bike, we have a few good Stevens X6 crossover (mountain)bikes, ready to use for a small fee. The nearest towns are Barchi (3 km), Orciano (6 km), Mondavio (7 km) and Fossombrone (12 km). They offer a variety of cafes, quaint narrow streets, picturesque shops, and well-stocked (super)markets. You'll also find many good restaurants located in the neighbourhood and you can go and taste local specialities (wine, olive oil, truffles etc.) right there where it is made or at the market. And there are many more activities nearby. Only 20 km from Montesoffio you can swim in the clear waters of the Adriatsche sea or the mountain rivers of the Apennines. You can go horseback riding, paragliding and in winter even skiing. Although golf is not yet really popular in Le Marche, it can be practised around Ancona and Rimini. The Marche is known for its untouched undulating hills, endless and commercialised sandy beaches and many traditional old medieval towns and villages. The coastline of Le Marche is 180 km and very varied, with pebble and sandy beaches and high cliffs, as in the region of the Conero. Located within Le Marche, in the Apennines, are two national parks - the Monte Sibillini and the Gran Sasso. The area is comprised of sweeping mountain ranges and spacious highlands where vast herds of sheep graze the rolling hillsides. In addition there are several nature-reserves and forest areas, which along with many of nature's other wonders you'll encounter, are home to the wild horses that roam the countryside. Le Marche is also very rich in culture and history. 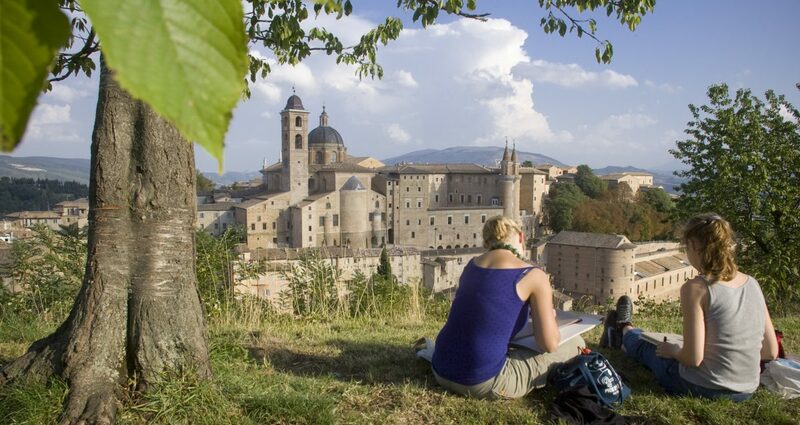 Our estate is encircled by numerous extraordinary medieval towns, and beautiful old coastal cities like Fano and Senigallia and the city of Urbino. Other historically important cities such as Arezzo (in Toscana), and Gubbio, Perugia, Assisi and Spello (in Umbrië) are also easily reached from our location. For an overview of the distances and travel-times from Montesoffio to some important Italian cities you can click HERE. Download hier de brochure Eating events or Sagre (in .pdf format).